What does “civil law” mean? A basic civil action is a lawsuit filed by one person - the plaintiff - against another person - the defendant or respondent - in which the plaintiff wants the defendant to pay money to compensate the plaintiff for harm the defendant caused to the plaintiff. The most common areas in which these types of disputes arise are when someone fails to stick to the terms of a contract or fails to pay for services that were rendered; someone gets hurt in a car accident; when there is a dispute over a property line; and when a landlord wants to evict a renter. Child custody and divorce issues are also civil in nature. There can be a criminal prosecution at the same time that there is a civil lawsuit. In a criminal prosecution, the defendant faces jail time; in a civil lawsuit, the defendant may have to pay money damages to the plaintiff. What are the different courts? 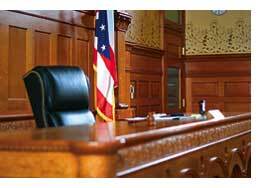 In the state court system there is the Small Claims Court, in which you will have a hearing in the Justice Court before a Justice of the Peace. Small Claims are disputes involving claims for money, but not for real property, up to $5000.00. (NRS, Chapter 73 and Justice Courts Rules of Civil Procedure (JCRCP) 88 -100.) Small Claims would be the place to go to get money back from your security deposit from your landlord, or collect funds owed to you from property damage or maybe a car accident. The legal justice system is essentially divided into two basic categories: criminal which deals with crimes for which you can possibly go to jail or prison (and which topic is dealt with elsewhere on this website); and civil which deals primarily in money disputes between people or between people and companies and suing for monetary damages to compensate for an injury to property or a person, or for breach of a contract, or for issues involving real property. Once you turn 18, you can sue or be sued in a civil court. Most lawsuits are filed in District Court. If the amount claimed as damages is under $40,000, then the case may be sent to arbitration under the Nevada Arbitration Rules. Most cases filed in District Court are settled by the parties before they go all the way to trial. If you do go to trial and lose in the District Court, you may file an appeal to the Nevada Supreme Court. In the federal system, the United States District Court is the trial court, and the Ninth Circuit Court of Appeals is the court in which you would file your appeal. The two court systems involve different laws and rules. But unless you try to sue someone out of state, or you are working with a specific federal law, most likely any lawsuit you find yourself involved in will be in the state District Court. Are there time limits for filing a lawsuit? Yes. There are statutes of limitation for almost all types of claims. They are set out generally in Nevada Revised Statutes 11.090. If you fail to file your complaint within the time limits set by the statutes, then your case will be dismissed and you will not be able to move forward. How do I know if I get sued? And what do I do? You have been sued if you are handed a “Summons” that has been issued by the clerk of the court. It will tell you that a “Complaint” has been filed against you and who filed the Complaint. It should also give you a copy of the Complaint. You will have twenty (20) days to file an “Answer.” NRCP 4. What if I just ignore the Summons and pretend I don’t know about the lawsuit? Or what if I just leave the state? If you do not respond to the summons and complaint, then a default and a default judgment can be entered against you by the court. A court can enter judgment for the full amount that the plaintiff asks for, and you will thereby owe that amount under the law. On the basis of that default judgment, the plaintiff who sued you will be able to contact your employer and take or “garnish” a portion of your wages, or may be able to get access to the value of your property to satisfy the judgment. The judgment will not go away and can also be recognized and enforced by other states. Having a judgment entered against you can also affect your ability to obtain credit and loans. You are not required to hire an attorney, and if the action against you is in Small Claims Court, you must represent yourself. But you can always consult an attorney. And if the complaint against you is filed in District Court, it is in your own best interests at least to talk to an attorney, and you probably should hire one to help you defend yourself. By the same token, if you file a lawsuit against someone in Small Claims, you must do it yourself; but if your case is in District Court, you should probably hire or “retain” an attorney. If you choose to represent yourself, you will still be held to the same knowledge and understanding of the system and the laws as an attorney. What if I don’t have money for an attorney? There are various offices locally that can help you with debt collection and bankruptcy, immigration, housing discrimination, some employment and public access claims under the Americans with Disability Act, landlord/tenant issues, consumer issues - such as dealing with retailers who won’t give you what you have paid for, family law and domestic violence problems, and help with children if you don’t have enough money to hire a private lawyer.